2.3. How does Mahara fit in to the e-learning landscape? 2.4. What if Mahara does not support a feature I want? 2.6. Where can I get ideas of how to use Mahara? 2.9. Which version of Mahara do I have? Welcome to the Mahara user manual. This user manual is designed to provide documentation for people who use Mahara on a day-to-day basis. It covers the functionalities of Mahara to provide you with information about what you see on the screen. If you’re wondering what Mahara or an ePortfolio is, why you might want one and what it can do for you, then read on. You’re about to find out. 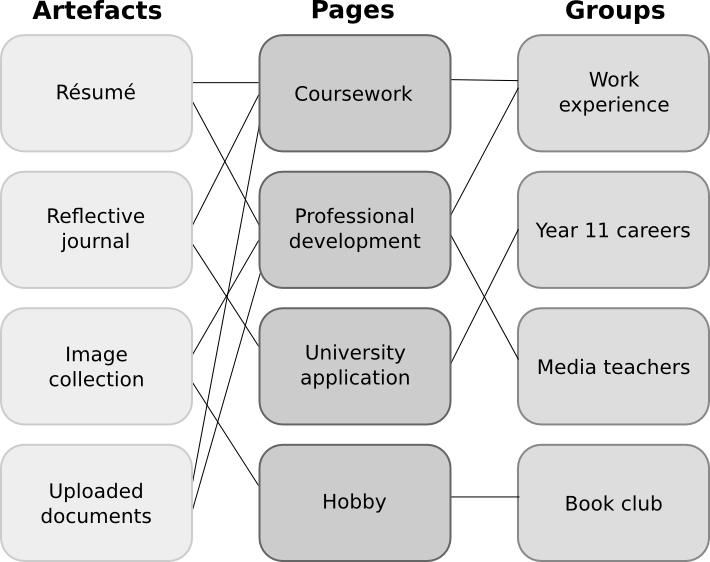 At the simplest level, Mahara is two things: an ePortfolio and a social networking system combined. An ePortfolio is a system in which students can record “evidence of lifelong learning” – such as essays, artwork or other such things they produce that can be stored digitally. Such things are known as artefacts in Mahara. Social networking systems need little introduction – think Bebo, Facebook or MySpace (back in the old days). Basically, they give a way for people to interact with their friends and create their own online communities. But Mahara is much more than just a place to store files. Mahara also includes blogging, a résumé builder, and web services to integrate with other platforms. Here’s a short video by Domi Sinclair from University College London. She explains what Mahara (called “MyPortfolio” at UCL) is and for what it can be used. If you think of LMSs such as Moodle, Canvas, and Blackboard as the formal, structured side of e-learning, then Mahara is the social, reflective side. An LMS and an ePortfolio complement one another in an online learning environment. In particular, while Mahara’s APIs are open to all, Mahara can integrate with Moodle natively to provide a streamlined user experience. This is not limited to SSO via MNet. Students are able to export assignments, blogs and much more straight into Mahara to use as artefacts, which can then, of course, be placed into pages. Mahara has been designed from the ground up to be an open, pluggable system. Creating new artefacts, authenticating against a custom system and much more can be implemented simply through writing a plugin that uses the appropriate core API. What this means is that it is free and easy for you to customise almost anything about Mahara to suit your needs. Paid support is available through a network of Mahara Partners should you require it. The Mahara newsletter features individuals and institutions and their use of Mahara. You can subscribe to it or read it online. It is published four times a year, and you can contribute your ideas as well. You may wish to check the list of books or papers that have been published on Mahara or what users talk about in conference presentations. Contextual help is available throughout Mahara via the Help icon . Click on it to find out more about the action you are about to perform. Mahara aims to be usable by as many individuals as possible, including those with disabilities or special needs. Creating accessible web content is a requirement in many countries. In order to provide international guidelines, the Web Content Accessibility Guidelines (WCAG) were created. There are three conformance levels under the WCAG 2.0, the latest edition of the guidelines: A, AA, and AAA. Each level requires conformance with previous levels and includes its own specific guidelines for how websites should be made accessible. With version 1.9, Mahara has reached level AA for user-facing areas of the system. The administration of Mahara is predominantly on level AA as well. We endeavour to keep up level AA to continue to provide good navigation of the site to everybody. The Mahara project can only control the accessibility of the navigation and overall platform. People uploading or creating content are responsible themselves to make their content accessible. If you come across accessibility issues, please file a report in our bug tracker and tag the item “accessibility”. You can make sure to refer to the correct user manual. You can find out whether you are on a currently supported version of Mahara or on an older one. If you are on an older version of Mahara, you can check the user manual for the new features. When you report a bug, you are often asked to specify the version of Mahara in which you noticed the problem. You can find out easily which version of Mahara you use by looking at the site’s HTML source. It’s not as scary as it sounds. In your browser, make a right-mouse click in any of your Mahara pages. Select the option “View Page Source”. Look for the meta tag “generator”. Make the “Develop menu” visible: Safari → Preferences → Advanced → select “Show develop menu in menu bar”. Make a right-mouse click in any of your Mahara pages. Select the option “Show Page Source”. Only the major version number of Mahara is displayed for security purposes. The minor version number is only visible to the administrator on Administration → Admin home. We recommend you keep Mahara up-to-date with security updates to ensure that your instance is not vulnerable to known security issues.